Located in Brooklyn between 41st and 44th Street between 5 and 7 Ave, this park is known for the spectacular views of NYC it provides. 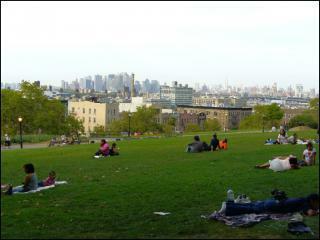 The park got its name because, in summer, you can watch the sun set over the NYC skyline and harbor. Even in colder months visitors can climb to the highest point of the park and see all of Downtown Manhattan, the Statue of Liberty, and even New Jersey. The park itself also houses a public pool and recreation facility for visitors. Sunset Park provides a sustainable impact on the environment of the neighborhood it is located in.